Treat your taste buds and add an extra boost of taste to your dishes with Knorr Herb Infusion Stock Pot. With quality ingredients, the authentic flavours of Knorr Stock Pot Herb Infusion 4 x 28g are perfect with dishes ranging from risottos to pies, soups and more. Your family and friends are sure to love the flavour of our Herb Infusion Stock Pots. On top of the mouth-watering taste, our Herb Infusion Stock Pot is quick and easy to prepare. Simply add the stock directly to your dishes, or alternatively, dissolve into 500ml of boiling water. Additionally, for a lighter stock, use 750ml of water, you choose whichever way you fancy! Either way, Knorr stock will be ready in minutes! Knorr Stock Pots are also free from artificial preservatives, artificial colours and have no added MSG, making them an excellent choice for creating a family-favourite meal. Use Knorr Herb Infusion Stock Pot to create a delicious, rich accompaniment to your main dish. You can find a great selection of recipes from Knorr and discover other quality stock pot variants such as Ham & Chicken at www.knorr.co.uk, don’t hesitate to take a look! 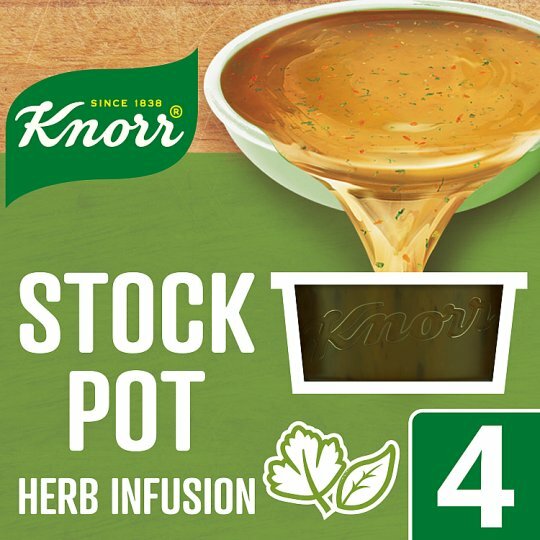 Did you know, you can either add Knorr Herb Infusion Stock Pot directly to your dish, or alternatively, dissolve into 500ml of boiling water? Store in a cool dry place. After opening store in the fridge for up to 3 days. Product can crystallize – this is a natural process which doesn’t impact on product quality. How to use Knorr Stock Pots: Adding directly to your dish, each versatile little pot will enrich gravies, pastas or even stir fries, smoothly melting to bring a full and rich taste. Alternatively, dissolving into 500ml of boiling water will make a delicious stock for soups, risottos or casseroles. For a lighter stock, use 750ml of water.